When I was a kid, I was obsessed with airplanes, or really, with any man-made flying machine. Planes, helos, zeppelins, gyrocopters, what have you – I would, in those pre-internet days, spend hours reading books full of facts and figures and pictures and stories about them (that is, when I wasn’t busy building plastic models of them or watching reruns of Airwolf, Baa Baa Black Sheep, or Tales of the Gold Monkey). A few of the more colorful and interesting accounts of the early days of aviation have stuck with me through the years, and it has occurred to me that there is one in particular that may be of some relevance to my readers. Toward the end of World War I, a charming but eccentric man by the name of Dr. William Wallace Whitney Christmas founded an aircraft manufacturing company in Washington, DC. This was perhaps a bit of an odd thing to expect him to do, as there exists no evidence that Dr. Christmas, who was a physician by training, had any background or practical experience in aeronautical engineering, or in fact in any kind of engineering at all. He claimed to have built airplanes before that point, but no record has ever been found to support this other than his own word. Despite his complete apparent lack of qualifications in the field he was entering, he nevertheless managed to find a pair of wealthy brothers – Alfred and Henry McCorry – who he was able to talk into providing him with financial backing while he worked on his projects. Since he did not actually own a factory at which airplanes could be built, he traveled to Long Island to visit the Continental Aircraft Company, where, trading both on his remarkable powers of persuasion and on the still-palpable war fever in which the nation had been gripped, he was able to convince its corporate leadership that his newest design, which he had named the “Bullet”, would be the key to the success of a daring plan he had developed to bring an end to the war by secretly landing an airplane behind German lines, kidnapping Kaiser Wilhelm II, flying him to Britain, and forcing him to sign a surrender. Having secured Continental Aircraft’s agreement to build his airplane for him, Dr. Christmas next needed an aeronautical engine, which in those days (and especially with all available production going toward the war effort) were both expensive and not easy to come by. Undaunted by this, Dr. Christmas visited Army headquarters in Washington, on a mission to get them to loan him an example of the most powerful engine they had. Here once again a combination of his personal charm and wartime desperation worked to his advantage, and he was able to talk his way into possession of an experimental Liberty VI engine, which developed a then-incredible 215 horsepower. To the Army’s credit, they were sufficiently skeptical of the entire matter that the loan came with the proviso that their engine was to be used only for ground testing of the prototype Bullet; he was not to take it into the air until the Army had gotten a chance to inspect and do a full evaluation on the new aircraft. Eager to get his hands on a Liberty VI, Dr. Christmas agreed. As for the actual design of the Bullet, what Dr. Christmas called “innovative”, others would call “ludicrous”. He claimed that its weird-looking, flattened-egg-shaped fuselage – made of veneered wood – was going to provide unprecedented reductions in aerodynamic drag, and that its flimsy wings, which he said that he had deliberately designed to flex and bend, were more than strong enough to support its weight. In an article about the Bullet in the British Flight magazine (which still publishes today, as Flight Global), Dr. Christmas even went so far as to declare that the Bullet had “a safety factor of seven throughout”, despite the magazine’s observation that “it would seem that such construction would result in a low factor of safety”. The editors of Flight were not, however, the only people who knew a lot about airplanes and who began to voice serious misgivings about the Bullet. When Dr. Christmas finally submitted his blueprints to Continental Aircraft, the company’s in-house head of engineering (Vincent Burnelli – who would go on to make some genuine innovations in the area of “flying wing” type aircraft, of which the modern B-2 bomber is perhaps the most famous example) came up with a long list of changes that needed to be made before the Bullet would be airworthy. Not least among Burnelli’s concerns was Dr. Christmas’s insistence that the Bullet be made out of cheap scrap wood and metal, which the Doctor claimed would minimize both the cost of building it and the strain that its construction would place on supplies of critically-needed resources during wartime. Once again, Dr. Christmas was able to convince others that his plans were sound; Continental’s management sided with him over Burnelli’s objections, and the Bullet was constructed exactly the way that Dr. Christmas wanted. And then, suddenly, the war ended. While the rest of the world celebrated, Dr. Christmas found himself with serious reason to worry. The end of the Great War meant that generous wartime contracts for new weapons would quickly evaporate, along with the willingness of the Army, industry, and investors to try just about anything, no matter how strange it might seem, as long as there was the slightest chance that it might contribute to victory. At this point, the first prototype had been finished and a second, for which an engine had not yet been found, was under construction. Dr. Christmas knew that he had finally had to show what the Bullet could do, and show it fast, before both the interest and the money that his supporters had been giving to him began to dry up. Of course, Dr. Christmas had never actually flown an airplane himself, so personally test-flying his airplane was out of the question. Fortunately for him, thousands of freshly-demobilized Army aviators were coming home from the war. The airline industry was not yet even in its infancy, and jobs flying the mail were scarce, so many of them found themselves unemployed and without any prospects of flying for a living. Dr. Christmas put out an offer of generous pay for any who would become a test pilot for his new airplane. Man after man turned up, took one look at the Bullet, spun around on their heels, and left, declaring that no amount of money was worth their lives. Finally, Dr. Christmas found one pilot – one Cuthbert Mills – who was either brave or desperate enough to try. And so one cold day in January of 1919, the first Christmas Bullet took to the sky from the Continental Aircraft factory’s airfield. It climbed a few hundred feet in the air, at which point Dr. Christmas’s innovative thin and flexible wings broke off. What was left of the Bullet plunged to the ground, killing Cuthbert Mills instantly. Vincent Burnelli was livid. Continental Aircraft was deeply embarrassed. The Army, which Dr. Christmas neglected to tell about the crash and the destruction of their expensive loaner engine, was beginning to get impatient. Dr. Christmas, however, was undaunted. Next time, he promised, would be a complete success – all he needed to do was make a few minor adjustments to what was an essentially flawless design. He turned on the charm again. Somehow, he managed to convince Continental Aircraft to finish the second prototype. Somehow, he managed to scrounge up an engine for it (this time, a much less powerful Hall-Scott model L-6). 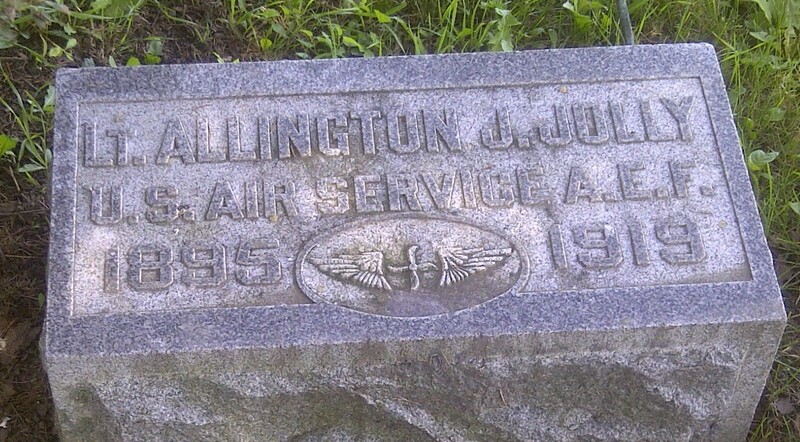 Somehow, he managed to find someone – this time, an Army pilot named Lt. Allington Jolly – to fly it. Somehow, he managed to talk his way into having the second Bullet displayed at Madison Square Garden as a way to gain publicity and public support. The display claimed that the Bullet had been demonstrated to achieve speeds of nearly 200 miles per hour – the fact that it had done so going straight down after its wings had fallen off was a detail that Dr. Christmas felt it unnecessary to mention to the gathered crowds. And so one warm day in April of 1919, the second Christmas Bullet took to the sky. It climbed a few hundred feet in the air, at which point its wings broke off, and it plunged to the ground, killing Allington Jolly instantly. Continental Aircraft walked away. The McCorry brothers walked away. The Army, which had thousands of now-unneeded surplus airplanes on its hands and no war to fight, and which probably wouldn’t have put any more money into the Bullet even if it had turned out to be everything that he had promised, walked away without even bothering to sue Dr. Christmas for the lost engine. The world moved on; only two minor pieces of the story remained. One of them was the grieving families of Cuthbert Mills and Allington Jolly. The other was Dr. William Wallace Whitney Christmas. Dr. Christmas never stopped telling anyone who would listen that the Bullet was just one minor alteration away from being a historic, world-changing success. When, in 1930, Flight published an article giving a full account of the affair, Dr. Christmas had his lawyer send an angry letter denouncing them, calling their report “false and scurrilous”, stating that the Bullet had been a tremendous achievement and that it had only crashed due to careless flying on the part of Cuthbert Mills (the letter made no mention at all of Allington Jolly or the second Bullet), claiming that mountains of evidence (none of which he actually bothered to provide) attested to all of this, and vaguely but unmistakably threatening legal action if any further “injurious and libellous” articles about the Bullet appeared in their pages. In fact, to his dying day, Dr. Christmas continued to insist that he had hundreds of patents to his name (of which no record exists or ever has existed), that he had designed dozens of successful airplanes (the Bullet is the only one that there is any real evidence for), and that he was on the brink of revolutionizing aviation. A New York Times article from 1950 records the 85-year-old Dr. Christmas still darkening the doorstep of the military, this time trying to sell the newly-created U.S. Air Force on his design for a massive “flying battleship” (the Pentagon, in an unusual bout of sanity, passed on the idea). Dr. Christmas died in the spring of 1960, at the ripe old age of 94, forty-one years after he had killed Cuthbert Mills and Allington Jolly and well into a jet age that had materialized despite him rather than because of him. And thus ended the story of the Christmas Bullet. Machines are made by humans, and thus the machines that we create are, whether we intend them to be or not, an extension of our own heart and soul. They come from us; they are creations of our minds, and therefore their stories are our stories. And while many of their stories have no great meaning, some of them become parables that teach us about ourselves and how our minds work. The most famous of these is, of course, the Titanic, which serves as a warning against the dangers of hubris in the face of nature. Was it really unsinkable, as all the smart men of its day – all the engineers and shipbuilders and sea-captains – said it was? No, and none of us have to be engineers or shipbuilders or sea-captains to be able to say that with authority. All we need to know is that it actually sank; the wonderfully complex and informed reasons that the wise, educated, experienced, and smart offered as to why it could not sink came to nothing as soon as it did. History is reality, and reality is final – as the saying goes, “let reason remain silent when experience gainsays its conclusions”. The Christmas Bullet, too, serves as one of these parables, and it has its own lessons to teach us about modernity in general and Marxism in particular. Certainly, the parallels to the latter are exceptionally strong. Like Dr. Christmas, Karl Marx was a crank who had no qualifications whatsoever in the field into which he inserted his ideas. Like Dr. Christmas, Karl Marx simply sidestepped this rather obvious criticism by claiming to be self-taught, even though the discipline involved takes years of study and practical experience (none of which either of them had a lick of) for men to to master (and, as the example of the Titanic proves, even then they are often wrong). Despite this, both men claimed to have hit on a scientifically incontrovertible answer to a difficult problem that the best and most qualified men of their time had all somehow overlooked. Like Dr. Christmas, Karl Marx told desperate people something they intensely wanted to believe – Marx that the terrible poverty of the early industrial age would inevitably give way to a workers’ paradise, and Dr. Christmas that the horrendous carnage of the Great War could be brought to a swift and easy end by a deus ex machina secret weapon. Like Dr. Christmas, Karl Marx’s invention crashed and burned every time it was tested in the real world, leaving an awful trail of death and destruction behind it. Like Dr. Christmas, Karl Marx’s defenders insist that if those ideas had not been interfered with by lesser men full of jealousy or malice, or if those who tried putting them into practice had not been incompetent, or if just a few more minor adjustments had been made, things would have gone exactly as they promised. But like Dr. Christmas, Karl Marx’s errors were not mere matters of detail; the whole concept behind their ideas was fundamentally flawed – their plans were ridiculous on their face, and any precocious schoolchild who wasn’t blinded by desperately wanting to believe in them could identify all of their glaringly obvious shortcomings. There are two important differences, however. One is that the Christmas Bullet only killed two innocent people, while Marxism killed a hundred million of them (although there is no doubt in my mind* that Dr. Christmas would have, without a second thought, sacrificed that many, and more, to the cause of proving his ridiculous theories correct if only he had the chance to). The other is that precisely nobody in the field of aeronautical engineering still defends Dr. Christmas, whereas academia, media, and the arts are full of defenders of Marx’s ideas, and they never run out of reasons why history is not in fact reality and reality is not in fact final. These reasons, of course, are ridiculous, as I can show by using the parable of the Christmas Bullet. Using the logic of these sophists, I can prove to you without a doubt that Dr. Christmas’s airplane never crashed. Let us start by offering a definition of an “airplane” that I believe we can all agree upon: An airplane is a device with wings that flies in the sky. Fair enough? Well then, as soon as the wings fell off of the Christmas Bullet and it ceased flying and started plummeting, it wasn’t an airplane anymore, because airplanes are things that have wings and fly in the sky. Thus, we cannot say that the crashes of the Christmas Bullet represent a failure of Dr. Christmas’s airplane, because at the moment it crashed, it wasn’t really an airplane anymore. Ridiculous? Obviously so. But this same argument is used by the defenders of Marx. 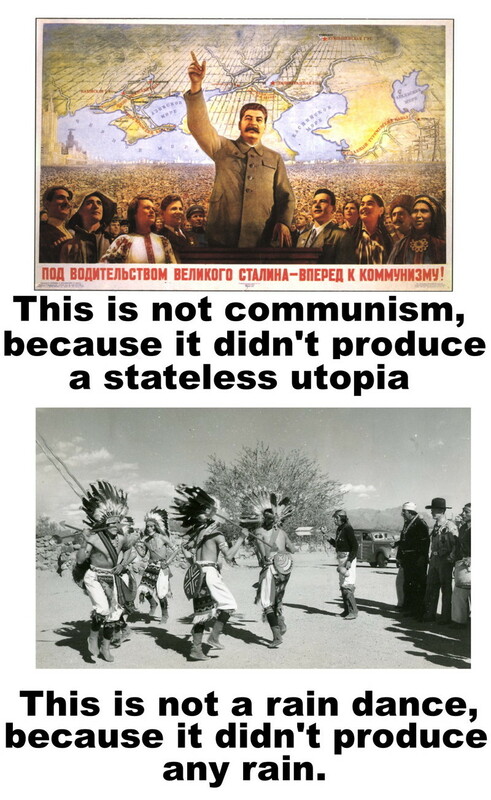 According to them, when Stalin and Mao and Pol Pot began to murder and oppress their people, then what they were doing became not-communism, because communism is defined as a thing that liberates instead of murdering and oppressing. Thus, we cannot say that what they did represents a failure of communism, because as soon as they did it, it wasn’t real communism anymore. Dead-ender Marxists will also insist that, with just a few more adjustments, communism could be made to work. (A good example of this is the Venus Project, whose adherents serve up a warmed-over communism that they insist will work this time because computers). They will challenge you: prove that it could never work! And, to be fair, I cannot. But I also cannot prove that no way could ever have been found to make the Christmas Bullet work. I do know this much, however: There sure as hell isn’t any way that someone could ever talk me into getting into that thing and flying it. What about you? Those who deny the validity of historical experience as a tool of epistemology and who insist that it does nothing to falsify their favorite theories ignore a truth that every adult should have a strong grasp of: Any crank, con man, or snake-oil salesman can make big promises – but it doesn’t matter what someone can promise, the only thing that matters is what they actually deliver.